For all other users, when they posted any Cash Receipt, an Analytical Accounting Journal report would open with some entries on it; particularly with 5 cash receipts. User, who reported the issue, confirmed that the records shown on AA journal report were posted by her and only after posting them, the above error message appeared. Since the report is AA journal, I first checked the AA Sub Ledger tables (AAG20000 series) and confirmed that the entries shown on the AA journal report are present without any issues. If I get rid of the above error message, things would be normal and this particular user can continue with her entries. Task on hand is to find out AA journal report tables and see the stuck/orphaned records and clear them. Issue: Records got stuck on AAG50000 (AA Sub Ledger Report Header), AAG50001 (AA Sub Ledger Report Distribution) and AAG50002 (AA Sub Ledger Report Assignment) tables. Resolution: Remove them. Simple. What you MUST note here is that all records (including genuine ones) would be present on these tables. You MUST note down AA Sub Ledger Header ID of the ones that are stuck and use below query to delete records. Replace <aaSubLedgerHdrID> with respective AA Sub Ledger Header ID of the stuck records. NOTE: Always take a backup of records before you delete. CBM – User [username] is busy with batch [batchname]. As promised in my previous article, here we go. CAUSE: There will be an Activity record inserted when you open a Batch for Payment Entry, in the table CB300006 (Display Name: Batch Entry Records Locked). This does not get cleared at times. I. Follow the Resolution Steps I & II from this article: http://www.vaidy-dyngp.com/2010/04/cbm-checkbook-checkbook-id-is-already.html. II. Run the following query once above steps are completed. We are good to go now. 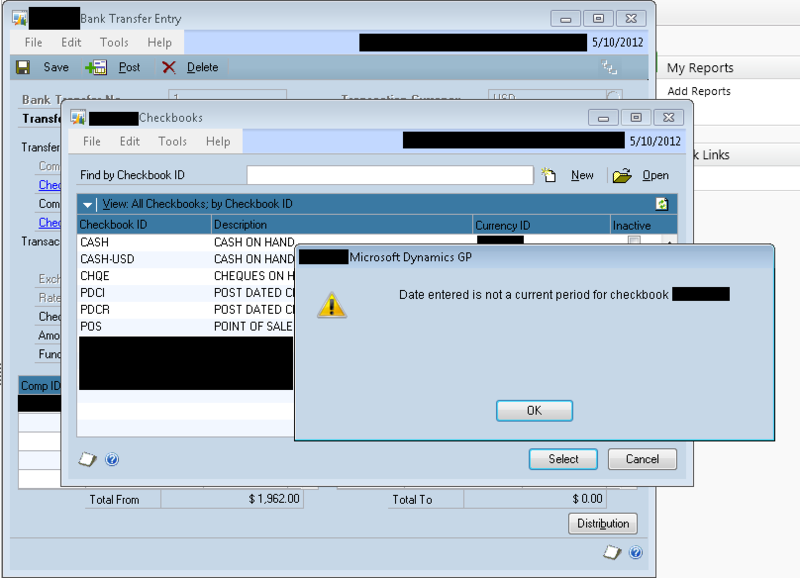 CBM – Checkbook [checkbook id] is already in user by user [username]. This happens when the User try to reconcile from CBM Reconcile. And once he/she selects the Checkbook which needs to be reconciled. 1. If you open the form, enter the Checkbook ID and just close it without any activity, this record is not cleared. 2. 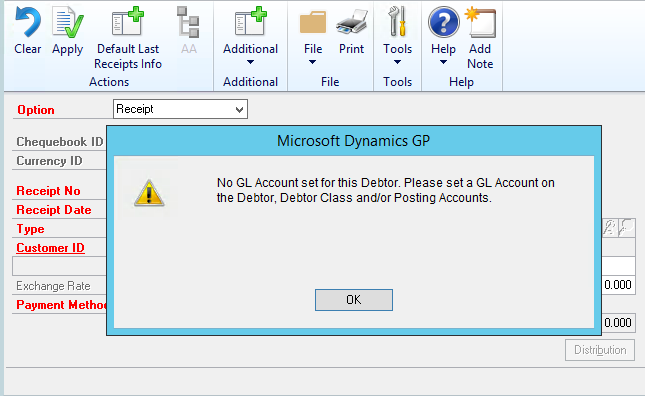 If you open the form, enter the Checkbook ID and just close GP directly without any activity, this record is stuck. The above scenarios are faced by me and have not heard of this from any other consultants, so the above need not be recreated consistently. I. Consultants must open SQL Management Studio, log on to the Data Server and connect to relevant company DB. This below queries will delete all stranded and unwanted SQL Sessions. The below queries will ensure that the respective user, against whom the error message was thrown, would be cleared from GP Application Session(s). –Ask that user to log off, if this user has logged on for the day. That’s it. We are good to go with our Checkbook Reconciliation in CBM. NOTE: I will be posing another article on CBM Payments Batch Lock Error (which is identical to this error message).